I don't know whether I should take the literal meaning of this quote or not. Literally, I don't believe that knowledge is the only good; I think that knowledge and goodness are too separate virtues that don't affect each other. 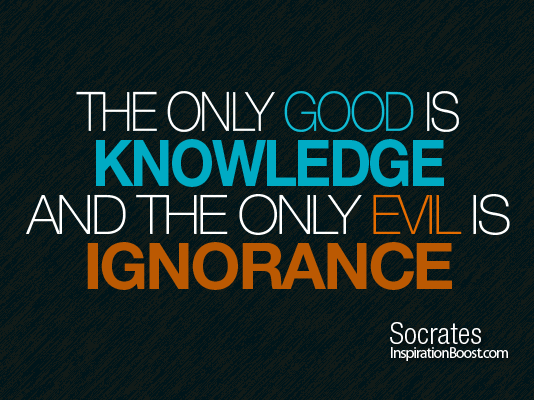 A "knowledgeable" person may not always be good, a "good" person may not always be knowledgeable. Right? Okay, no. Wrong. It depends on the context really, but maybe the good people all have the best kind of knowledge. I mean, if they have achieved a balance of happiness and goodness, then they must possess the knowledge of being able to attain such a position in their lives. I picture a good person, as that perennially upbeat person who is always so kind; who's always smiling, who's so pure and honest that when you look into their eyes you just know that you can trust them, that they don't have petty little problems, that they're on another level. We all know that one person who's so dependable, and so happy; that one person who knows about the bad things in the world, but chooses to ignore them. That one person who's so good but so strong but so happy. Maybe the good on-another-level people of the world have a knowledge of how to live...that's why they're happy. Maybe that's why we're (evil is wayy to strong a word) all lost. Okay maybe I should speak for myself, but from what I see in society, I think that most of us have lost our way and our looking for happiness. That's the ultimate goal really, happiness. Some of us have happiness, are at our goal, but we don't see it. That's why we're lost. We either aren't at our goal or we don't know that we're at it. We're ignorant and that's why we're lost. Maybe Socrates is right after all, the truly good and happy people are the one's who have a knowledge of themselves; they're those people who know the key to being on another level, they know the key to not letting the troubles of the world bother them. The good happy people know the key to happiness; they have it. The knowledge. Why does evil exist if God loves us?